Buy Here - Pay Here................................Customer Satisfaction is Job One ! ! ! At H and H Auto Sales our family has been serving the Unicoi, TN and surrounding area with great deals on cars, trucks, vans and SUVs for more than 25 years. 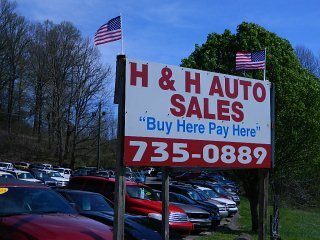 H and H Auto Sales is the premier BUY HERE - PAY HERE used car dealer in east Tennessee. 10% down plus sales tax and tag(about 20% total). We accept trade-ins. Easy payments can be made weekly, bi-weekly and monthly. Payments can be made over the phone via credit or debit or in person via cash, check, money order, credit or debit card. Feel free to browse our site to learn more about us and check out our current inventory. If you have any questions at all please feel free to give us a call!! !